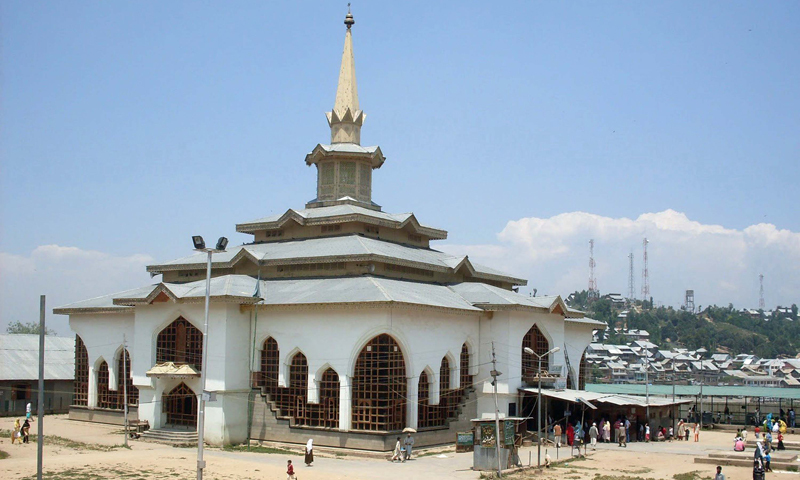 Shrine of Sheikh Noor-ud-Din Noorani in central Indian-administered Kashmir district Budgam. This shrine was gutted in 1995 when Indian security forces and militants exchanged fire. Photo: Bee, Bilal. 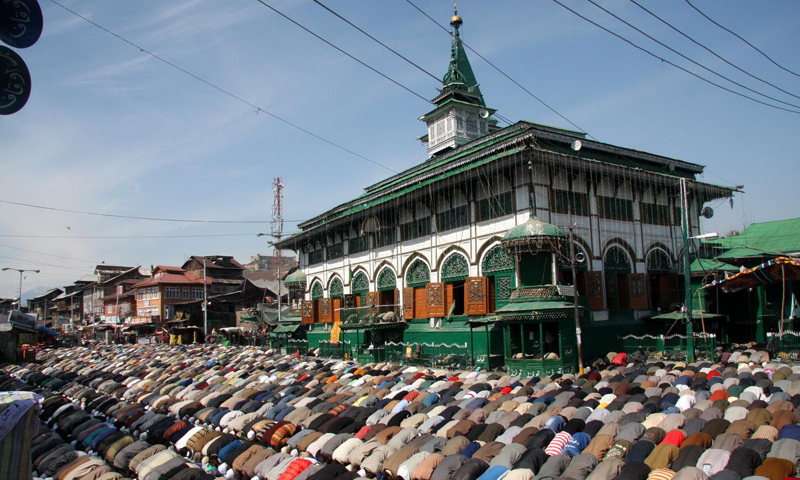 Another important shrine in downtown Srinagar is of Khwaja Naqshband Sahib. In the compound of the shrine the martyrs of July 13, 1931, who raised their voice against tyrannical Dogra rule, are also buried. Photo: Bee, Bilal. According to Zareef Ahmad Zareef, a well-known humorist-poet in Kashmir, the first Sufi Muslim saint from Central Asia to have visited Kashmir was Abdur Rehman. He later became popular as ‘Bulbul Shah’. This renowned saint of the highest spiritual order arrived in Kashmir during the reign of Bodh ruler Ranchan Shah. 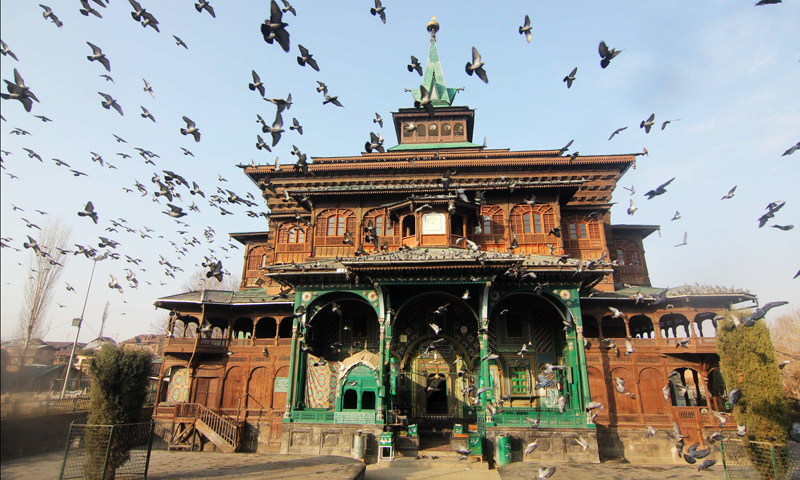 The shrine of Hazrat Syed Sharif-ud-Din Abdur Rehman, aka Bulbul Shah, the first Muslim Sufi saint from Central Asia to have arrived in Kashmir in 1324 AD, is located in downtown Srinagar. This shrine was recently renovated.Photo: Bee, Bilal. Abdur Rehman — believed to have travelled all the way from Turkistan — settled in Kashmir roughly around 1324 AD (725 A.H). His shrine is located in Srinagar city at a place called ‘Bulbul Langar’ (now Bulbul Lankar). It is an important place from both a historical and religious perspective. A Kashmiri myth about Hazrat Abdur Rehman is that he was so absorbed and engrossed in meditation that he wouldn’t disturb the songbird nightingale (Bulbul) sitting on his head. Many saints from different places like Central Asia and Persia (now Iran) have visited Kashmir. This is another important shrine in Khanqah-i-Moa’lla, Srinagar which has great historical and spiritual value. Mir Syed Ali Hamadani, many historians say, played a significant role in spreading Islam and spirituality in Kashmir. Historians agree that Mir Ali Hamadani— Persian Sufi of Kubrawi order, also known as Shah-i-Hamadan — visited Kashmir on three different occasions between 774-785 A.H (roughly 1373-1384). He moved to Kashmir along with his 700 followers referred to as Saadat. This prominent Muslim scholar and Sufi was born in Hamadan and buried in Khatlan. Satirist-poet Zareef Ahmad Zareef told Dawn.com that apart from his role in spreading Sufism and Spirituality in Kashmir, Mir Hamadani was also instrumental in refining the art. Mr. Zareef says that many in Kashmir, those days, were earning their bread through glyptography, the art of carvings on stones. “After mass conversion, a delegation of many such skilled workers and artisans approached Mir Syed Ali Hamadani for an alternative work, as they had abandoned ‘But-tarashi’ after embracing Islam. The great saint suggested that they make mosque pulpits, and carve 99 names of Allah around Mimbar, and also design the interior architecture of religious places,” says Zareef. The shrine of Mir Syed Ali Hamadani, who played a significant role in spreading Islam and Spirituality in Kashmir more than six centuries ago, has visited Kashmir thrice. His shrine is in Khanqah area of Srinagar. Mir Hamadan is buried in Khatlan.Photo: Bee, Bilal. 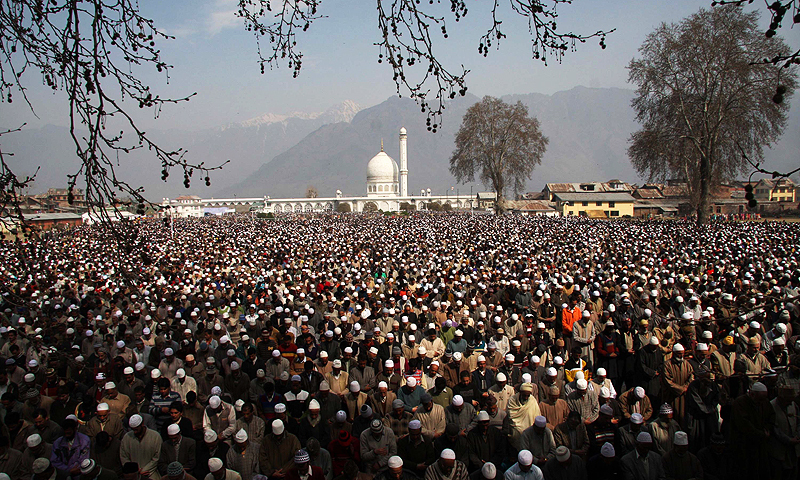 “People in Kashmir pay regular visits to the shrines for peace of mind. Many Sufi disciples, as per the teachings of their spiritual masters, recite special ‘Wazaif’ there. It has been a rich tradition of Kashmir since the past six-seven centuries now,” he adds. Kashmir has been ruled by Hindus, Buddhists, Mughal Kings, Afghans, Dogras and others. 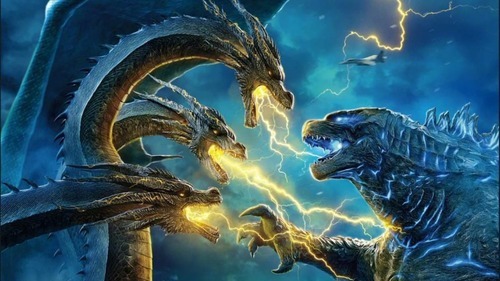 Their influence has remained in different spheres in some forms. There are also some shrines named after Sufis and Islamic scholars who have never visited Kashmir in a physical sense. One such shrine is built in the memory and respect of Sheikh Syed Abdul Qadir Jeelani, also known as ‘Gous-e-Azam’ and ‘Dastgeer Sahib’ by Kashmiris. 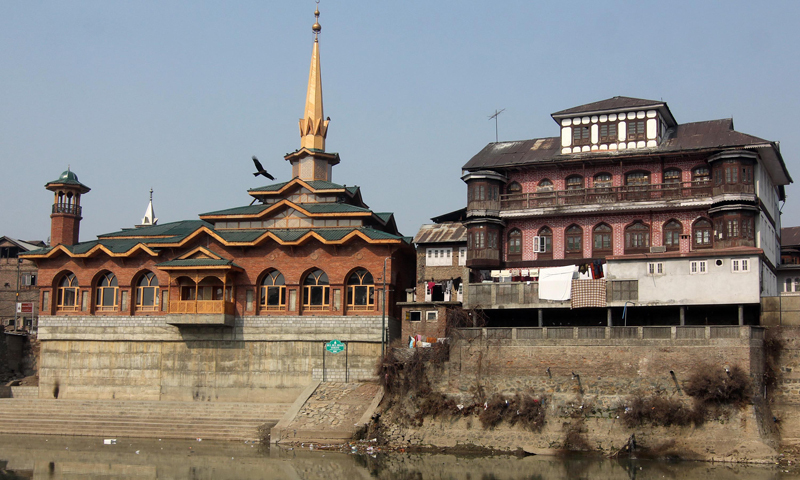 The shrine of Abdul Qadir Jeelani is situated in the heart of Srinagar city in Khanyar area. A shrine built in memory and respect of Hazrat Sheikh Syed Abdul Qadir Jeelani. The saint never visited Kashmir. He is buried in Baghdad. The old structure of Dastgeer sahib's shrine in Srinagar was reduced to ashes in a mysterious fire incident in 2012.Photo: Bee, Bilal. The old structure of Dastgeer Sahib Shrine was unfortunately reduced to ashes in a mysterious fire incident in June 2012. This architectural wonder was a symbol of Kashmir’s collective faith, spirituality and cultural heritage. The shrine, built around 200 years ago in Kashmir, was a mark of respect toward Abdul Qadir Jeelani, a saint who hailed from Gilan province of Persia. Dastgeer Sahib is buried inside a shrine in Iraqi capital Baghdad. Both Kashmiri Muslims and Hindus (also known locally as Pandits) hold the shrine of Dastgeer Sahib in high esteem. It is said that before their departures from the Kashmir Valley in early 1990, some Kashmiri Pandits too would pay regular visits to the shrine to purify their souls and discover spirituality within like their Muslim brethren would do. Makhdoom Sheikh Hamzah, a Sufi Muslim saint, was born to Baba Usman Raina in Tujar Shareef, a village in Kashmir, in 1494. As a great scholar and mystic, Sheikh Hamzah immensely contributed in spreading religious and spiritual knowledge. He continued preaching in Srinagar and the city outskirts. Sheikh Hamzah, a hereditary landlord, is also said to have donated land and other property in social service. A book ‘Tazkira-e-Aslaaf Yanee Sultan-ul-Arifeen’ by Professor Abdul Majeed explains the early childhood and spiritual journey of Sheikh Hamzah in some detail. This Muslim saint, historians say, did not rest during night for many years for he remained busy in prayers and meditation. The shrine of Makhdoom Sheikh Hamzah, a Muslim Sufi scholar and saint, is placed below the attractive Mughal Fort, on the Hari Parbat hill (Koh-i-Maran). It is a structure with many pillars, a rare example of Mughal architecture. Photo: Bee, Bilal. Makhdoom Sahib’s shrine is located below the eye-catching Mughal Fort, the Hari Parbat (Koh-i-Maran). The shrine is a structure with many pillars, a rare example of Mughal architecture. 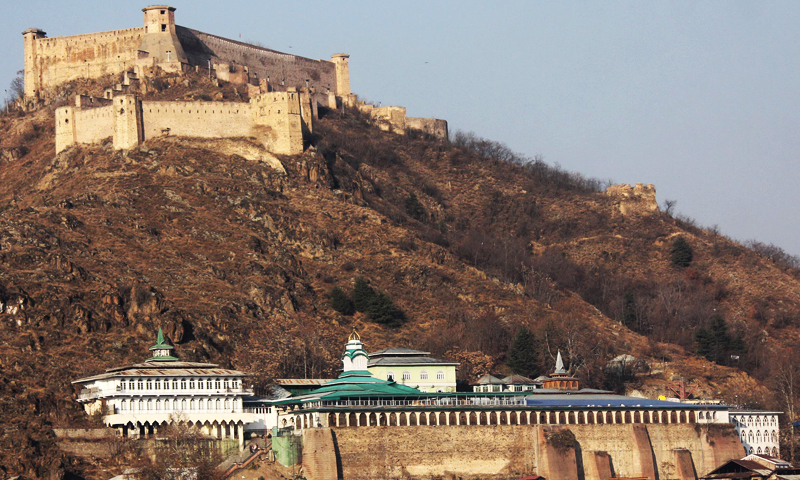 On Hari Parbat, a hill, Mughal emperor Akbar built an outer wall of the fort, in downtown Srinagar. Later, in 1808, the present fort was built under the reign of Shuja Shah Durrani, a Pashtun of the Durrani empire. This is a place where the hair strands of Propher Muhammad (PBUH) are said to be present as a holy relic. In December 1963, tens of thousands of Kashmiris were on roads protesting against the theft of the relic. The mysterious theft under the then Prime Minister of Indian-administered Kashmir Shamsuddin led to widespread mass unrest for about a month till the relic was recovered and identified. Other important Sufi Muslim shrines in Srinagar are those of Khwaja Habibullah Nowshehri in Nowshehra, Hazrat Khwaja Naqshband Sahib in Khwaja Bazar, Hazrat Mirza Kamil Sahib in Hawal, etc. There are hundreds of other important and famous shrines outside Srinagar as well. Prominent among those are the shrines of Hazrat Noorud Din, also known as Nund Reshi and Sheikhul Alam, in Chrar-e-Shareef in central Budgam district, Baba Reshi shrine in Gulmarg in north Kashmir district of Baramulla, etc. Followers of Sufi Islam are widespread in Kashmir. Followers of a more orthodox brand of Islam say that those who frequent shrines indulge in ‘grave worship’, which is forbidden by the religion. Some others even say that visiting shrines in itself is un-Islamic. But Sufis say it is wrong to assume that shrine-goers indulge in grave worship. They say they visit shrines only to seek the blessings of Allah. These places, they say, are sacred because spiritually-rich and great scholars are buried there. 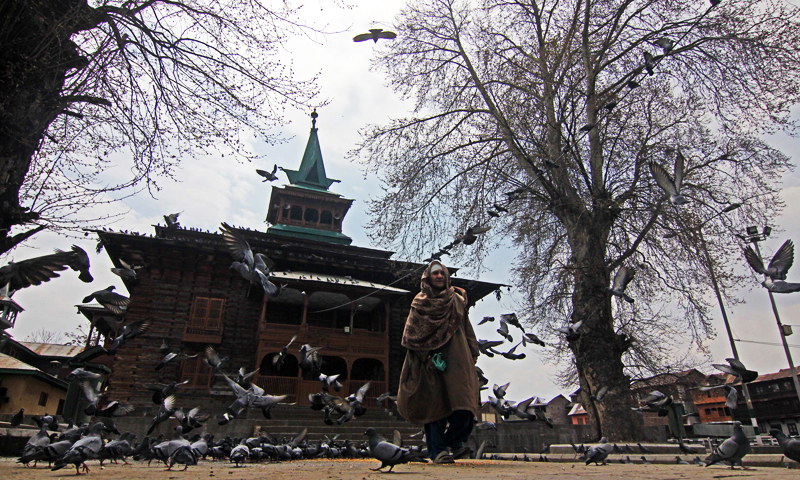 Hazratbal Dargah in Srinagar, where hair strands of Prophet Muhammad (PBUH) are said to be present.Photo: Bee, Bilal. The spiritual tradition has remained intact in Kashmir despite many overt and covert attempts of sabotage from various quarters from time to time. Many Kashmiris do believe that ‘suhbah’ (companionship) is necessary for spiritual seekers. Numerous Kashmiri families organize annual mawlud and participate in Zikr (Dhikr) gatherings. “These practices are going to transform under multiple pressures but we must take care that these sites reflect the thinking of Kashmir's spiritual teachers and remain retreats for those seeking comfort in the remembrance of God,” the scholar adds. Despite such challenges to the Sufi order, Kashmir remains a Pir Waer because of the history of spirituality in the region. “All three religions (Hinduism, Buddhism and Islam) have had a great history in Kashmir. Great Saiva, Vaisnava and Buddhists texts were composed here. Islamic spirituality has also left a deep impact on the region since about the ninth and 10th centuries. The practice of visiting shrines is in continuity in South Asia with the older practices of visiting monasteries and sacred sites—Asthapans— which has given us the Kashmiri word, Astan (shrine),” he concludes. Gowhar Geelani is a writer/journalist, who has served as Editor at Deutsche Welle (Voice of Germany) in Bonn, Germany. Previously, he has contributed features for the BBC.